Babirye takes a chainsaw to a tree stump at Socrates Sculpture Park. Born and raised in Uganda, Babirye started carving masks as a way of addressing the violent homophobia she and her friends faced there. I meet up with sculptor Leilah Babirye at the diner La Bonbonniere in the West Village on a sweltering Monday afternoon. Before we even sit down at our proudly unglamorous Formica table, Babirye is telling me a story. Her brother is threatening to disinvite her friends from his upcoming wedding in Uganda, where she is from and was forced to flee in 2015 after being publicly outed as a lesbian. “My friends there are all activists and openly gay,” she explains. “But he said, ‘I invited pastors, elders and people from the church—your friends will come with their locks, women dressed like men, men dressed like women.’” She smiles to herself as if to say: His loss—it won’t be a party without them. Since finding a home in the queer scene of Kampala, Uganda, Babirye has insisted on bringing her community with her everywhere she goes, and most especially into her work as a sculptor. For her first solo exhibition this past spring at Gordon Robichaux, Babirye made activist material out of her utopic, celebratory vision of queer life. The show, “Amatwaale Ga Ssekabaka Mwanga II (The Empire of King Mwanga II),” paid homage to the little-known, openly bisexual King Mwanga II who, in the late 19th century, fought against the colonial rule of Uganda by Western missionaries. Colonization would eventually poison the people against long-held cultural norms of matriarchy, feminine worship and queerness, helping to create the present-day environment of open hostility and homophobia that forced Babirye into exile. Babirye’s life was set to go on a very different track back in 2006, when she was on her way to check out the law school at Kampala’s Makerere University and came upon the university’s art school instead. There she saw Dr. Lilian Nabulime, a well-known artist and star of the university sculpture department, bent over a giant tree stump carving. “When I saw Dr. Lilian doing something I thought was supposed to be done by men, I said, ‘Could I do this?’” Nabulime encouraged Babirye to come to the art school and study sculpture with her. 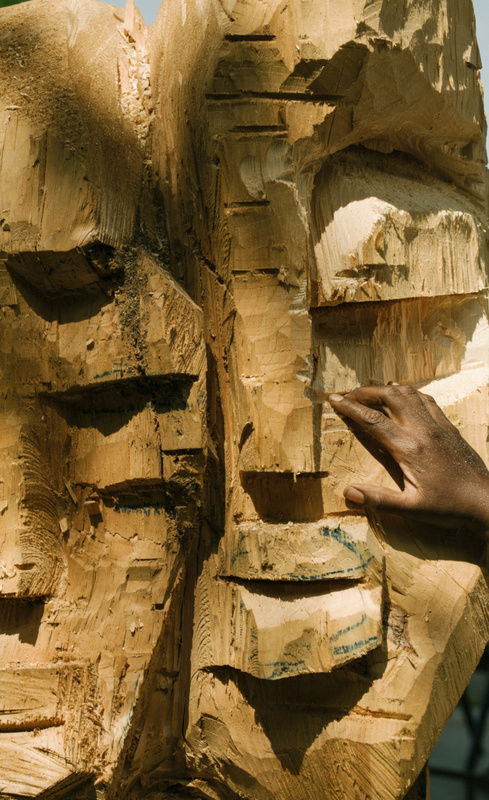 After learning West African carving techniques from a group of local artisans in Kampala, Barbirye developed her own takes on the material and form. Here, a face emerges from the sculptor’s blade. After she graduated, she began trying to sell her work and make a living as an artist. She also started going out to gay bars in Kampala, solidifying important relationships and developing a strong connection to the queer community. At the end of her gap year, her father and professors were pressuring her to go back to university and get an advanced degree in sculpture. She began looking for a dissertation topic. On television, she had seen footage of the memorial for David Kato, a young gay rights activist who had been violently murdered in his home. His friends, many of whom she knew from the community, were wearing masks over their faces at the funeral to protect their identities. The televised images of her friends’ concealed faces was a watershed moment for Babirye. She had found her dissertation topic: She would make masks as a way to talk about the struggle the LGBT community faces in Uganda. “That’s when I started making real art,” she says. “I thought, why not be wild and come out now? I was having issues with my family; my brother and dad were hearing rumors… My anger popped out. I was going to do things my way, not my parents’ way.” Nor the way of her mentors. When she told her professors what the masks would represent, they rejected the topic outright and left the room outraged. In the years that followed, Babirye went ahead in her pursuit of new methods and meanings, her art becoming her activism. There’s no mask-making or decorative wood- carving techniques unique to Central Africa; to learn the basics, Babirye sought out a local group of artisans that were producing masks in the West African tradition. Since the skills were borrowed and new to her, she had to get creative with the form and materials, a transcultural alchemy that helped her develop her own style and point of view, and a body of work reflective of the diversity of African art traditions. Babiyre in her outdoor studio. Produced by Michael Reynolds. In the homophobic climate that would reach its climax with Uganda’s infamous anti- homosexuality bill in 2013, Babirye’s work became increasingly urgent. In 2014, she was publicly outed in a massive inflammatory story in a local tabloid. Babirye had applied to the Fire Island Artist Residency in New York and was accepted. Fearing for her life, she left Kampala in 2015 with a travel visa and hasn’t returned since. And on Valentine’s Day of this year, she was granted asylum, an arduous process three years in the making. 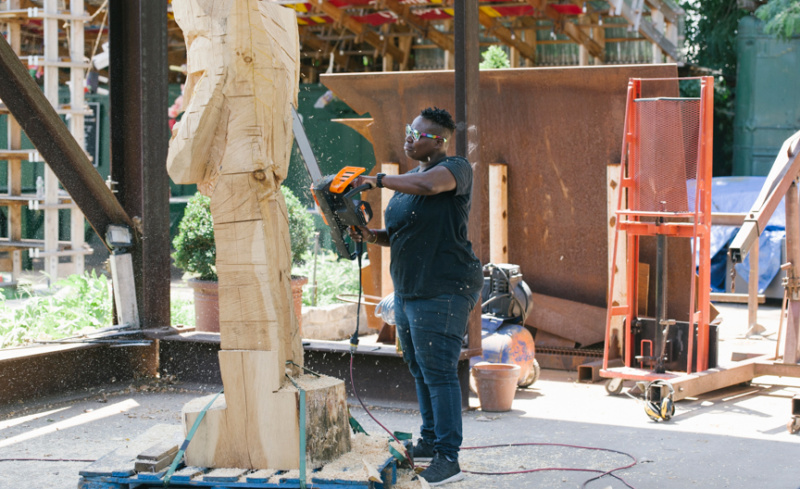 As a fellow at Socrates Sculpture Park in Queens, where she made a 12-foot sculpture that will be part of the Socrates Annual opening October 7, Babirye was given a production grant and daily access to the park’s studio and facilities. Unsurprisingly, she is keeping similar hours to the ones she did in art school: “The first to arrive and last to leave,” her gallerist Sam Gordon tells me. As to where her imagination is currently drifting, she muses affectionately: “I think I need to return to hair.” In an art world loaded with empty, trending gestures towards resistance and freedom, Babirye’s sincerity cuts through the noise, an embodiment of lived activism. Perhaps this is because Babirye never forgets whom her work is for. Love for her community fuels her sculptural forms, forms that exhume a dense tangle of queer struggle, joy and detritus, and get free.